Introducing the Stanton Bench MK2! The Stanton Bench is designed for people who have limited space to store tools or even to work in. The plans for the MK1 and MK2 have been available on Etsy and proven very popular, with over 450 sets of plans sold. If you live in an apartment block without a garage to tinker in then the Stanton Bench is for you. It can be used on a kitchen or dining room table without fear of scratching any surfaces. Combine the Stanton Bench with some good power tools that have great dust extraction and you can build pretty much any furniture or project you can think of. When you have finished being creative you simply unscrew 3 of the legs that lock the front apron onto the bench and slide the bench under your bed. This is not to say that you can’t use the Stanton bench in your garage if you have one. As a matter of fact, Dave has quite a large woodshop and relies on the Stanton bench often for use as a docking station and assembly table. Dave loves it! How do you get a Stanton Bench? If you want to build your own Stanton Bench, then you can purchase a digital download of the plans on this site. Watch the video below and watch Dave take you through the process with extensive details. NOTE: OUR ONLINE FORM IS NOT WORKING AT PRESENT. Please disregard it even though it is still on this page. 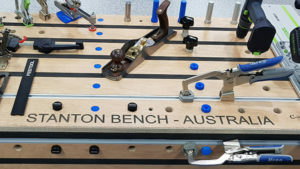 INSTEAD, Please send an email to dave@stantonbench.com.au to ask for a complete price for the Stanton Bench kit to be made for and sent to you. In that email, Specify your kit style of choice from #1a through to #4b, name, address including country, contact number for the courier, and your email address. At present this option is available for Australia/New Zealand and mainland USA/Canada. The Stanton Bench will be made from from Marine ply or HMR MDF in Australia, and from Baltic Birch ply or HMR MDF in the USA. HMR MDF is High Moisture Resistant Medium Density Fiberboard.